Jen Swearington has been creating artworks on bedsheets since 2000. Her innovative technique and distinct illustrative style set her at the forefront of the fiber arts field, most recently winning the Award of Excellence in Quilt National 2009. Her work have been featured in three Quilt National exhibitions, 500 Quilts, Fiberarts Design Book 7, Surface Design Journal, and graced the cover of Fiberarts magazine. Jen Swearington founded her production studio, Jennythreads, Inc in 2003. Jennythreads is a small but busy operation producing fine handmade silk and bamboo apparel and accessories carried in galleries and boutiques throughout the United States. 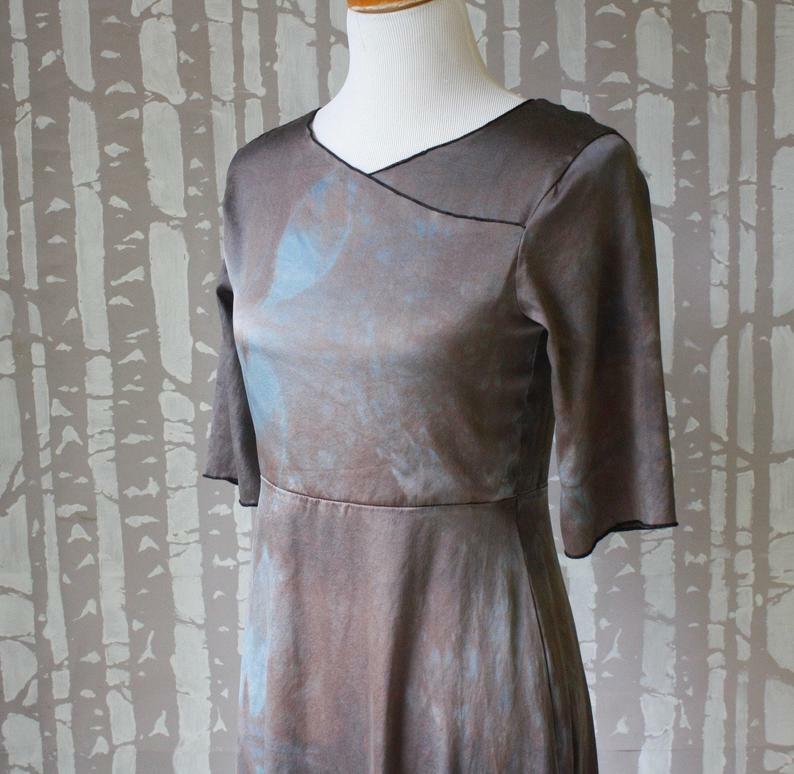 Each piece of fabric in every Jennythreads item is hand dyed and /or hand printed by the artist with imagery from her sketchbook pages and original hand-cut stencils. Jennythreads items have been featured in the New York Times, Belle Armoire, Niche, on HGTV, and won many awards at fine art and craft events. I piece together old bedsheets to form a basic background composition, stretch it like a painting, and then paint around all the patterned areas using gesso, a white painter's primer. I draw and paint using charcoal, ink, thread, and shellac, which lends the amber tones and protects and seals in all the imagery. I work on the composition in man sessions, allowing time to study it and contemplate what to do next. This process sometimes take weeks, sometimes just a few very intense days. Once I am satisfied with the drawing, I take the painted fabric off the frame, layer it with batting and backing fabric, and machine-quilt all the layers together. This takes several hours and wrecks my neck and shoulders as I wrestle with the thing to manuever it in my sewing machine. Then I trim the quilt square and bind the edges with cloth strips, handstitching the binding to the quilt back. I devised a hanging system that floats the quilt about two inches from the wall, hangs on a nail, and rolls up for shipping. After a while, the ferris wheel and the elephant sketched for North and South got burned onto silk screens to print many of the patterns onto my silk wearables. Here they are on a nimus wrap along with another sketch of a futuristic squirt gun. Adding these images to the clothing and accessories are probably my favorite part of what I do. It makes my clothing even more unique and rich. My silk wearables aren't just versatile and stylish, there are stories layered among the stitches. I construct each silk wearable from white silk off the bolt, and then dye it to place the pattern on the garment and the figure. Besides screen printing my drawings and found images, I also incorporate Japanese shibori dyeing in both additive and subtractive dyeing processes. I use the scraps from the clothing to collage my scarves together through artistic intuition, letting go of color theories and formulas to make unexpected, refreshing arrangements of color, pattern and texture. While my silk clothing pieces are highly individual, they are also practical. All items are preshrunk, dye-set, hand-washable, and can be worn casual or dressed up. I have so much fun wearing and layering my pieces with a vintage piece or over a cheap tee from target. These clothes are meant to be lived in, as they meant to exist in a realm between trendy and timeless; they are fun and fresh year after year. I am proud to make really fun, high-quality, easy wearable works of art.